Duck Family Day is a new feature we share every Saturday, where Oregon fans share their stories of being Oregon fans! Email charles@fishduck.com to share your experiences and what it means to be a Duck fan. Jim Anderson is a new writer for FishDuck.com and is extremely passionate about our beloved Ducks, the same as you. Contact us and share! There are different kinds of icons for different religions…Catholics have their saints, Muslims have their prophets, Buddhists have…hmmm, well, I’ll have to get back to you on that one. Each of us has our own religions or things that approach religions…I have my Ducks. My family, however, didn’t share the same devotion. Fouts hands off to Rashad (“See you at the Pro Bowl”). My earliest memories of the University of Oregon are of listening to the Duck games on the radio when I was about 15 years old. You’re going to have to forgive my memory as I am quickly growing older than the dirt in my backyard (I’m not as clean as the dirt according to my last girlfriend). Once in a while, a game would stick out and pay homage to my twisted imagination. 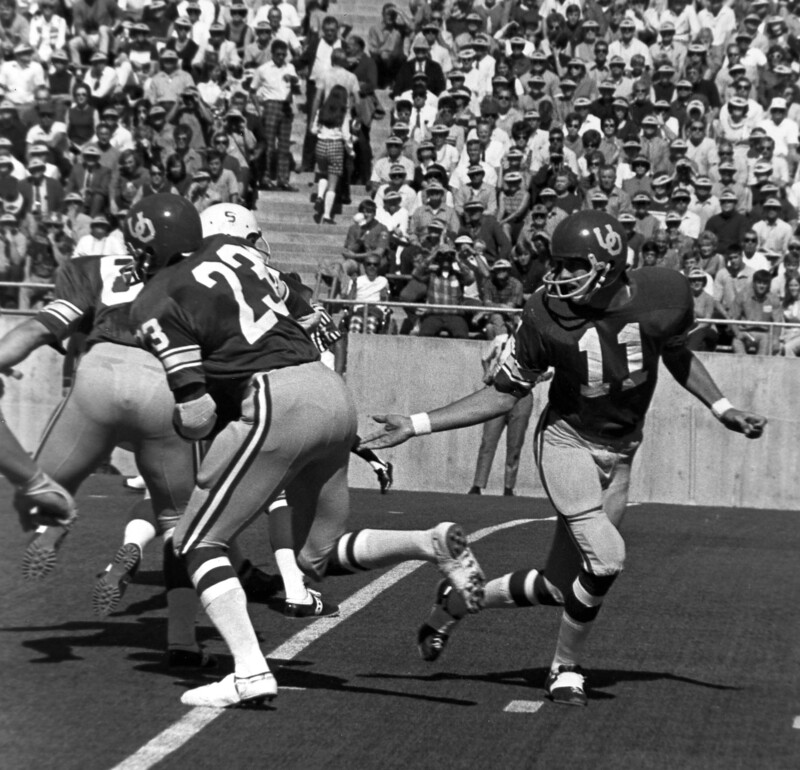 The game that really captured my attention (and created my religious fervor) was when Dan Fouts subbed in for Tom Blanchard against UCLA (I think it was in 1970). Oregon was behind by 40 to 21 and Fouts came in during the fourth quarter. (Fact checkers, you have to remember this was 45 years ago, so I am a bit fuzzy on the details). The Ducks were moving up and down the field. I was yelling at the defense and yelling at the Bruins when my older brother Don, came rushing in to find out what was going on. I was excited and tried to describe the game, but my troll of a brother told me that they were going to lose, anyway. After all, it was Oregon. 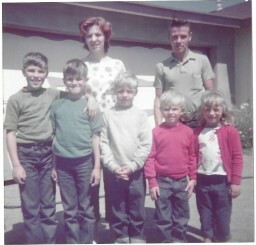 You have to understand, there is only a bit over a year separating us in age and I was big for my age. He did outweigh me by about 20 lbs and had been beating the crap out of me ever since I could remember. I had had enough of his insolence. He could beat me up, insult me and do whatever he wanted, but I couldn’t tolerate his insulting the Ducks. I jumped, and for the first time in our lives, I got the upper hand. As Dan was passing the Ducks down-field, we were participating in the age old ritual of brother bashing. When it was over, both of us were bloodied and bruised and smiling with newly found respect for each other. I jumped back on my bunk-bed and my brother was in the bunk below mine and was he cheering as loud as I was. That’s when my mother came in armed with a rolling pin to fight off the monsters that were invading our house and murdering her children. Chances are, she might have been coming in to murder us for destroying a perfectly peaceful Saturday afternoon. Either way, we were admonished to keep the noise down to a dull roar. We meekly turned the volume down on the radio and dutifully said our “Yes, Mom” and promised that we would . As time went on, he lost all interest in the Ducks because they couldn’t win their way out of a wet paper bag according to him. My younger brothers were a bit more malleable and I tried working the Ducks into their routine but, sadly, they just didn’t see the attraction. Many times, I tried to explain the finer points of my Duck worship but my mom came in and untied them and got them up from the floor. Somehow that just didn’t seem to inspire my brothers and they avoided me on Saturday afternoons after that. I think I ended up washing the dishes for two weeks after that incident. Later in life they warmed up and one of my brothers (Ted) actually got injured on the sidelines when some Oregon players plowed into him while he was photographing the game. To this day, I think he stole the press pass he used. I stuck with the Ducks and eventually chose the University of Oregon over Harvard and Yale (had they chosen to offer!). Years later, when Don was an Air Force recruiter in Springfield and he was trying to recruit a couple of docs out of the clinic that I was managing, he and I went out and hoisted a few at a local tavern and we talked about the day of our big fight. He admitted to me that he was surprised at the ferocity of my attack upon his august person. I told him that I was as surprised as he was. I am usually a mild mannered person and most of my friends will agree that I try to avoid conflict. But in this instance, my brother was messin’ with my Ducks. Don’t do that!